From the surface of the Earth to the deep ocean, bacteria and their extremophile relatives drive fundamental chemical reactions that transform the planet and sustain life. The biologists, geologist, chemists, and environmental scientists in the emerging field of geomicrobiology – the study of how microorganisms interact with earth materials and the environment — are revealing new information about the genetics and fascinating chemical processes of the microbes that inhabit Earth’s soil, rocks, water, and atmosphere. These investigations of modern life — for example at hydrothermal vents and shallow hotsprings – provide a window into Earth’s history, helping us understand the remains of ancient bacteria in stromatolites and other rocks. In the process, they provide clues to how life originated, evolved, and transformed our own and perhaps other planets. These investigations also point to new ways that bacteria can be used to decontaminate polluted environments. 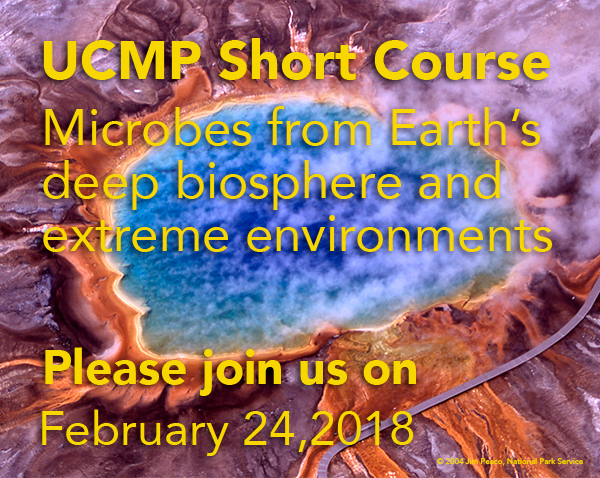 Please join us to explore these connections revealed by the latest research at the intersection of microbiology and geology. This short course is co-sponsored by the Berkeley Natural History Museums (BNHM) and Science@Cal. Stromatolites are layered, domed rocks traditionally interpreted to represent fossil bacterial mats (“pond scum”). As such, they could represent some of the oldest evidence of life on earth (perhaps as old as 3.7 billion years). Given that they may represent macroscopic manifestations of microbial processes—a structure that could be easily visible with a rover or other remotely operated vehicle—stromatolites have long been an exobiological target on Mars and elsewhere. However, there are underappreciated abiotic/inorganic processes that can mimic stromatolites. How do we tell the “real ones” from the “fake ones”? This presentation will discuss the hallmarks of life/not-life in stromatolites to better understand how they can be used to investigate the history of life on Earth or elsewhere, using modern examples from hot springs and lakes, ancient examples and laboratory experiments. Nitrogen is one of the key elemental components of all life as we know it. It is crucial for making the amino acids of proteins as well as for making DNA and RNA. Unfortunately, the vast majority of the Nitrogen on our planet is in the form of nitrogen gas (N2), which cannot be easily used by most organisms. Over billions of years, organisms have evolved complex reactions and symbiotic partnerships to use and recycle what little Nitrogen is available in the environment. My research group focuses on understanding how microorganisms living in high temperature environments, considered analogs for places where life first evolved, carry out these reactions and how they compete or collaborate to make the most of these limited resources. In particular, my presentation will focus on a group of microorganisms, members of the biological Domain Archaea, which were only recently discovered but appear to play a key role in Nitrogen biogeochemical cycling across our entire planet. Life has played a key role in shaping global geochemical processes over billions of years. However, studying the role of biological systems across geological timescales has proven to be a major challenge, as our understanding of early life has primarily been limited to observational studies through the fossil and geological records. Advances in molecular biology provide new approaches to revisit and investigate the early evolution of key metabolisms. The most distinct environmental change in Earth’s history was the rise of oxygen ~2.3 billion years ago and was in fact precipitated by a biochemical innovation – the evolution of oxygenic photosynthesis. My research focuses on reconstructing the biochemical transitions that have enabled the evolution of photosynthesis and its impact on Earth through the carbon and oxygen cycles. I will also discuss my work combining evolutionary and synthetic biology approaches to experimentally study and test hypotheses concerning the origins of photosynthesis. It is hard to believe but microscopic organisms in the world ’s oceans have a large influence on global climate. In fact, every second breath you breathe was produced by phytoplankton photosynthesizing in the surface ocean. As oxygen is produced, carbon dioxide, a major driver of climate change, is taken up by these organisms. However, only 1% of the CO2 taken up remains in the ocean due to the complex interactions between phytoplankton and other marine microbes such as, microzooplankton grazers, bacteria, and viruses. While 1% might seem insignificant, it actually accounts for half of the carbon dioxide that we put into the atmosphere each year by burning fossil fuels. During this lecture will explore the complex microbial interactions that influence carbon uptake by the ocean through biogeochemistry, molecular biology (DNA and RNA), and classical microbiology. Where synthetic biology meets E.T. Synthetic biology – the design and construction of new biological parts and systems and the redesign of existing ones for useful purposes – has the potential to transform fields from pharmaceuticals to fuels. Research at NASA Ames focuses on the potential of synthetic biology to revolutionize all three major parts of astrobiology: Where do we come from? Where are we going? Are we alone? Synthetic biology is allowing us to answer whether the evolutionary narrative that has played out on planet Earth is likely to have been unique or universal. In my lab we are re-evolving the biosynthetic pathways of amino acids in order to understand potential capabilities of an early organism. Beyond Earth, we will rely increasingly on biologically-provided life support, as we have throughout our evolutionary history. In order to do this, the field will build on two of the great contributions of astrobiology: studies of the origin of life and life in extreme environments. Frank Corsetti is Professor of Earth Sciences at the University of Southern California and studies the co-evolution of the Earth and its biosphere from a geobiologic perspective. Frank’s best know work is on “Snowball Earth”, the most severe glaciation known that occurred ~700 million years ago, but other recent projects include the origin of animals, mass extinctions, and investigations into new biosignatures for use with ancient rocks on Earth and other locales in our solar system (e.g., Mars). Frank has studied rocks as old as 3.5 billion years and as young as those forming today, and field sites are located in the US, Canada, Mexico, Peru, Australia, Namibia, and China. Frank earned his PhD from UC Santa Barbara. José de la Torre is an Associate Professor of Biology at San Francisco State University where he studies the evolution and ecology of microorganisms involved in the Nitrogen Cycle. His research group is particularly interested in high temperature environments such as terrestrial hot springs in Yellowstone National Park and hydrothermal vent systems at the bottom of the ocean. José is also working to understand how complex microbial communities may be involved in the formation or alteration of minerals and rocks over the history of our planet. José earned his Ph.D. in Biochemistry and Molecular Biology from the University of California, San Francisco. Patrick Shih is a Postdoctoral Fellow at the Lawrence Berkeley National Lab and UC Berkeley. His research is focused on understanding the origins and evolution of photosynthesis using phylogenetic, molecular biology, and synthetic biology techniques. Patrick earned his Ph.D. in Plant Biology from UC Berkeley. Bethanie Edwards is a chemical oceanographer with a strong interest in the microbiology of the ocean. Currently, Bethanie is a postdoctoral scholar conducting research at the Hawaii Ocean Time Series using meta’omic techniques to investigate deep-sea microbial communities. In summer 2018, she will join the Department of Earth and Planetary Science at UC Berkeley as an assistant professor exploring the role of lipids as biomarkers and chemical signaling between microbes that cycle carbon in the surface ocean. She earned her PhD from MIT/Woods Hole Oceanographic Institution. Lynn Rothschild is an Astrobiologist/Synthetic biologist at NASA Ames and Adjunct Professor of Molecular Biology, Cell Biology and Biochemistry at Brown University. Her research focuses on how life evolved in the context of the physical environment, on Earth and potentially other planets. She has brought her expertise in extremeophiles and evolution to synthetic biology in support of NASA. She earned her B.S. degree from Yale University and a Ph.D. from Brown University.